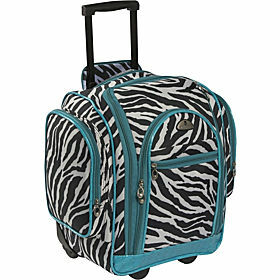 This super cute Zebra print carry-on luggage will take you really far with ease. This stylish animal print travel bag has many compartments, clear organization pocket on the inside of the bag and helpful front flap that opens completely down. American Flyer has been designing classic and casual luggage for over 20 years. American Flyer luggage is built strong and functional to provide travelers with luggage items they can keep for years to come. American Flyer offers many fantastic colors, patterns, and luggage sets to choose from, all at a great price.